Already own a condo in the Seafarer? Thinking of selling? Click here and read about current search trends & our web network. Seafarer condo is located in the middle of the island of Perdido Key, FL and offers residents the best of both worlds with access to both the gulf beaches and boating facilities on Old River. Amenities for the Seafarer include a boat launch, docks, boat storage, tennis courts, recreation room, swimming pool and 600 feet of beach front plus 600 feet of river front. Seafarer consists of 47 condos built in 1978. Units are available in 2/2 or 3/3 floor layouts ranging from approximately 1,140 to 1,400 square feet. Seafarer is adjacent to popular beachfront restaurant, The Crap Trap, and minutes away from entertainment, dining, and numerous water activities located on the state line. Similar gulf front condos with boating facilities include Seaspray, Needle Rush Point, Shipwatch, and Windward. 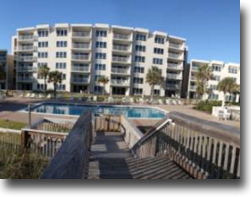 Use our site to find beachfront properties along the Gulf Coast or visit our city-specific pages such as Orange Beach Condos for Sale or Gulf Shores Condos for Sale. Please let us know if you would like further info for the Seafarer or other Perdido Key FL condos, homes or real estate along the Gulf Coast or would like to schedule a private viewing by emailing info@condoinvestment.com or by calling (251) Area-Pro (251-273-2776) for immediate assistance.